Mikaela Shiffrin and Lindsey Vonn, arguably the two best skiers in U.S. history, trained on the same mountain, competed for the same club and live four miles apart. That's where the similarities end. VAIL, Colorado -- Mikaela Shiffrin stood in front of a dozen journalists, relaxed and ready for the questions. In the midst of the 2015 Alpine World Ski Championships, the 19-year-old Olympic slalom champion was at a local restaurant to promote her new cookbook, "Winning Recipes from Mikaela Shiffrin." Someone asked about Bode Miller. "He's such a Viking," she said. Someone asked about her recent coaching switch, from Austrian World Cup veteran Roland Pfeifer to Vail club coach Brandon Dyksterhouse, who was appointed to the U.S. team three weeks before worlds. It's no secret the move was made to serve Shiffrin. "Sometimes you kinda just need a change," she said, shrugging her shoulders. Any lucky charms? No, but she often takes a shot of espresso 30 minutes before a race. "Pretty much, I listen to my music and I do my word searches," Shiffrin said. "Those are the two things that get me revved up to ski." At just 19, Shiffrin has already won 12 World Cups, two world titles and an Olympic gold medal. And what does she think about being called the future of women's ski racing? "I'd rather be the future of women's ski racing than not even on the map." Shiffrin has been on the map since she was 12. But the future of women's ski racing? It's a debate that continues to percolate. Like Sidney Crosby and LeBron James before her, Shiffrin's quick rise to success has led to predictable comparisons with the greatest ever, in her case Lindsey Vonn, who has more World Cup wins than any woman in history. Their simul-stardom and Shiffrin's inevitable role as challenger to Vonn were supposed to come to a head at worlds. But they didn't. Vonn entered four events but left with just a super-G bronze, while Shiffrin won gold in the slalom. 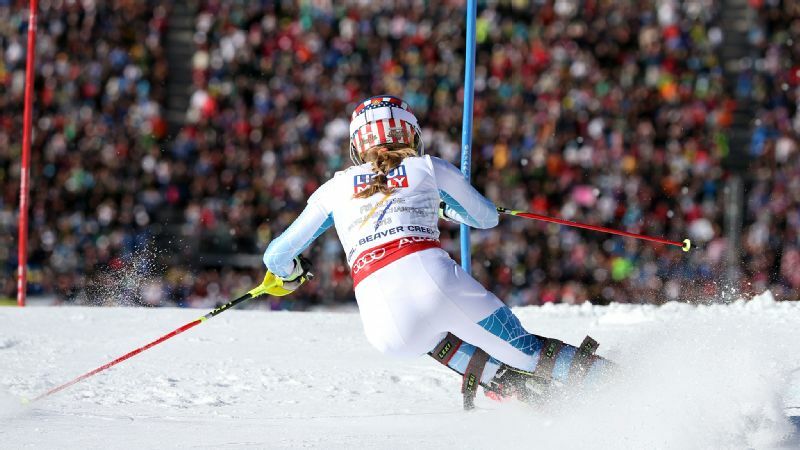 The only time they competed in the same race, the giant slalom, Shiffrin took eighth and Vonn 14th. And just as Vonn's career accomplishments are sure to follow Shiffrin like a cartoon cloud, so too has Shiffrin's potential followed Vonn. An article last fall in USA Today hinted that a rivalry had developed. Vonn declined ESPN.com's interview requests, but Shiffrin again dismissed the notion. "There isn't any animosity between us," she told ESPN.com. "There couldn't be if we wanted it, because we're not ever together. "I pay attention to what she's doing. I really try to take an objective approach and watch her career based off of how hard she works and how professional she is, especially about skiing," Shiffrin added. "And I've tried to adopt that into my style. She's very high-profile in the sport and everybody's watching her, and so am I." As both skiers return to the World Cup circuit this weekend in Maribor, Slovenia, the global audience will get another glimpse of their collision course. It may be a year before we know how it fully unfolds, however. If Shiffrin puts into motion her ambitions of expanding into a four-discipline skier and contending for World Cup overall titles, there will be more opportunities to see her and Vonn compete against one another. Shiffrin understands the potential intrigue of such a situation. "If there's two girls who are rivals then people will love it," Shiffrin said. "Because it's like, who's gonna win, Mikaela or Lindsey? But I'm not really interested in that." She means the rivalry. She is very interested in winning. Perhaps it was fitting that Shiffrin ended up the last, best hope for an American woman to win gold at worlds. These were supposed to be Lindsey Vonn's world championships, where the greatest female racer in history came home three weeks after setting the all-time World Cup wins record and carried the U.S. Ski Team to its coronation. Shiffrin, favored in slalom and a contender in GS, was to race in the final days of the fortnight, when Vonn's shadow already would have been cast. Except there was no shadow this time. Vonn, 30, hampered by her still-recovering right knee, never found a rhythm; her lasting image was one of disappointment when she left Beaver Creek in tears after straddling a gate in the combined. Shiffrin, meanwhile, outshined the woman she idolized for much of her youth. Lindsey Vonn, the most decorated World Cup skier in history, is the gatekeeper to the downhill. If Shiffrin wants to expand into other events to win an overall world title, she will have to race against Vonn. "I truly believe that pressure is what you make it," Shiffrin said after coming from behind to win the slalom. "And if you work hard enough and you prepare well enough, no matter how much pressure you feel, you can still perform." Twenty years from now, we could look back at this era and marvel. Assuming Vonn continues to win World Cup races until her likely farewell at the 2018 Winter Olympics in Pyeongchang, South Korea, and Shiffrin keeps up her historic pace (she has already won 12 World Cups, two world titles and an Olympic gold medal, all as a teenager), the duo's shared nationality and overlapping career timelines would be enough to inspire "remember when" comparisons. But the comparisons run much deeper. Each grew up skiing in Vail and competed for the same club, albeit at different stages of their careers. They still live there, approximately 10 miles apart. They are obsessively devoted to their sport and can call themselves Olympic champions. Each has a local thoroughfare named after her (a ski run for Vonn, a street for Shiffrin). They are obsessively devoted to their sport and can call themselves Olympic champions. Like Vonn, who started out as a slalom racer before segueing into speed events like downhill and super-G, Shiffrin has achieved almost all of her early success in slalom, winning 11 of her 12 World Cup races. She says she wishes people wouldn't call her "the next Lindsey Vonn," but only out of deference. "I really don't mind the comparisons -- it's an honor for me to be called the next Lindsey," Shiffrin said. "But I think it's almost offensive to her, in that she's still here, and she's still winning. For people to say, 'There's this girl coming up, she's the next you,' it's like, 'Well then, I guess I should hang up my skis now, because we already have another Lindsey Vonn!'" I really don't mind the comparisons -- it's an honor for me to be called the next Lindsey. But I think it's almost offensive to her, in that she's still here, and she's still winning. Shiffrin is no longer the upstart she once was, but when you are Mikaela Shiffrin, you never really stop posing a threat. "I get that feeling, too," she said, "so I'm sure there was a little of a threatened feeling when I was coming up. I imagine when I'm more of a veteran and somebody else is coming up, or even in the next few years, when I hear a name of somebody who's coming out of the woodwork, I'll be thinking, 'Oh, no'" -- she turned and wagged her finger like Dikembe Mutombo -- "'not yet.'" Others in the sport are guarded in their predictions and comparisons, partly to honor Vonn's achievements and partly to respect the realities of racing down a sheet of ice at 70 mph. "That's a long shot," former U.S. women's coach Alex Hoedlmoser said of Shiffrin's potential to match Vonn's victory total. "There are so many things that can happen in a career. Mikaela is super-talented and, for me, the best slalom skier ever on the women's side. She's also an unbelievable GS skier, and she's been really good in super-G, too. "But to be that consistent on top over so many years like Lindsey, it's not going to be easy for anybody to break that record, and a lot of things can happen." Going into this season, the U.S. team's plan was to enter Shiffrin in a World Cup super-G before the world championships, then give her a start in front of the home crowd last week with Vonn. But unexpected struggles in slalom -- she finished 11th, fifth and fourth in the first three races, a huge drop from the past two seasons when she won back-to-back World Cup slalom titles -- led the team to abandon its super-G plan and focus on getting Shiffrin back on track in her primary discipline. "I thought I had completely lost the touch for ski racing," she said. 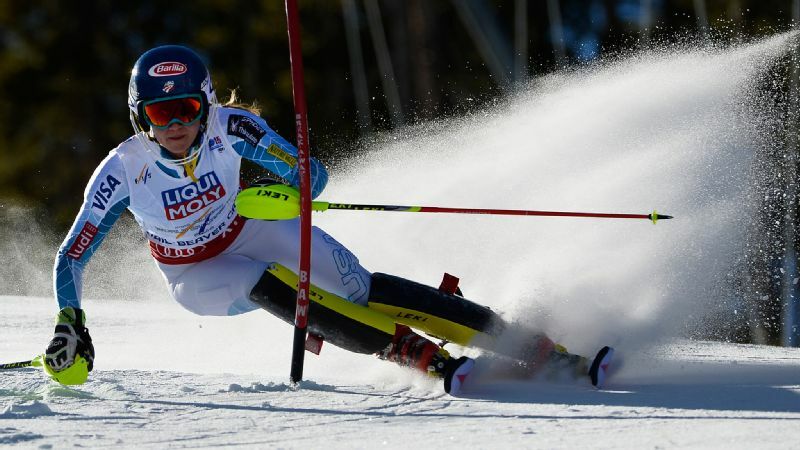 Aided by changes to her ski and boot setups, she has since finished first, first and third and currently ranks second in the World Cup slalom standings and fourth overall (Vonn is third). Vonn, at 5-foot-10 and 160 pounds, is better built for speed races than the 5-foot-7, 145-pound Shiffrin. Vonn also is blessed with a rare touch in gliding sections. She entered her first downhill -- ski racing's king discipline -- during her second year on the World Cup circuit and won her first downhill at age 20; it could take another one or two years for Shiffrin to be ready. And once she is, more than likely, she will have to beat Vonn to win. "If Lindsey stays healthy," U.S. alpine director Patrick Riml said, "there's no question in my mind she is going to ski at a very high level for the next three years. She'll be competitive in downhill, super-G and also GS." Shiffrin's aim remains to excel on scarier courses. "I'm actually really comfortable with the speed," Shiffrin said. "I'm just not so comfortable with the turn radius and the longer skis and making quick moves; it's like carrying a building on your feet." U.S. speed coach Stef Abplanalp coached Shiffrin in super-G for three days in December and was surprised by how quickly she implemented input and improved. "I'm pretty confident she will be strong in that discipline in the next two years," he said. "She has the skills. "What Mikaela has already done is big," Abplanalp added, "and she's for sure on the way to be, together with Lindsey, one of the greatest female athletes we've ever seen ski." As Shiffrin continues to win, her profile will rise much like Vonn's did. The teenager says she's ready to handle the pressure and attention that comes with success on the slopes. Vonn and Shiffrin may be similar on snow -- "Racehorses," Abplanalp said, "able to bring it when it counts" -- but they are radically different away from it. Vonn dates Tiger Woods, recently bought a home and gets chased by paparazzi. Shiffrin lives at her parents' house, dates U.S. "B" Team racer Brennan Rubie and has a self-imposed 8:45 p.m. curfew. Vonn's top sponsor is Red Bull; Shiffrin's is Barilla pasta. Vonn is represented by IMG; Shiffrin's agent is ex-Austrian racer Kilian Albrecht, who lives in Innsbruck. Vonn has more than 1 million Facebook likes. Shiffrin has 237,000. 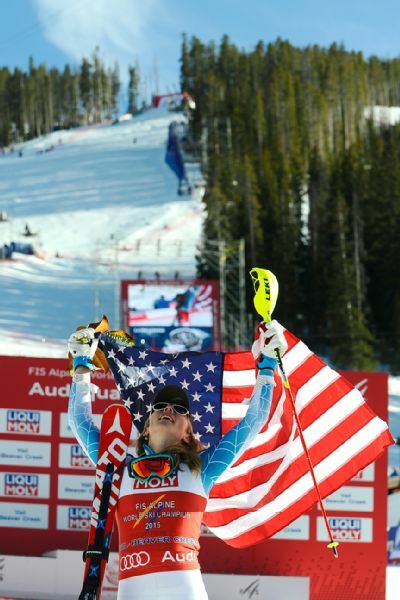 "Over all those years, Lindsey became a celebrity and a superstar because of her success in skiing," Hoedlmoser said. "And it's going to happen to Mikaela, too. The more she wins, there's going to be more sponsors, more fans, more press -- all the stuff that Lindsey already went through. And it's really hard for an athlete to keep focusing on the task." Shiffrin swears she's ready, and she is nothing if not grounded. "I'm trying to build my image around being really holistic and always staying true to myself," she said. So far, the skiers' courses have rarely intersected, but that will soon change. Riml said he plans to keep an eye on them, but he doesn't foresee a problem. "Any federation in the world would love to have two exceptional athletes who are gunning for everything," Riml told ESPN.com. "I think there is mutual respect, and they can learn from each other. They have different needs. Our goal is just to make sure both of them get what they need so they can perform at the highest level. "There is competition," Riml added. "They both want to win. I'm looking forward to that. Hopefully we're going to have a couple more who want to win someday, too."